The Transporter is a provider of AIRPORT shuttle services. We provide rides for individuals, families, companies, groups in need of an airport shuttle from the Island to/from the airport. We offer a first class service which is affordable, comfortable, secure and prompt. Some of our service offerrings includes a spy police and a protocol personnel on board our shuttle buses, free Wi-Fi, passenger insurance, free water etc. 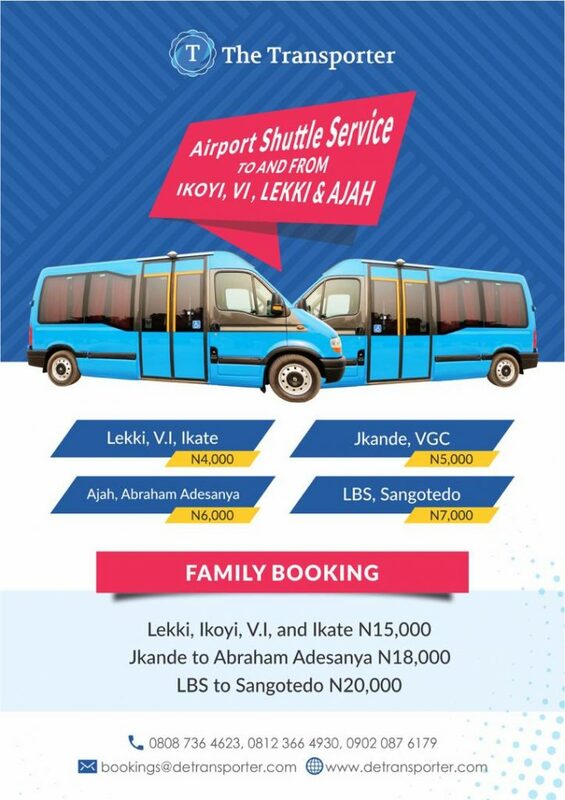 Our fliers gives an idea and insight of what our shuttle buses look like and a break down of our prices from different locations on the Island to/from the airport. At THE TRANSPORTER there are no hidden or extra charges involved. For more information and inquiries, visist http://www.detransporter.com or you can reach us via our numbers: +2348123664930, +2348087364623, +2349020876179. Why the wait!!! Hit us up as soon as practicable.